For those interested in purchasing the 2:1:1 Recovery post workout powder I’ve written a review of the product below. This review is completely form personal experience, as I am currently on about my 6th or 7th jug of 2:1:1 Recovery. 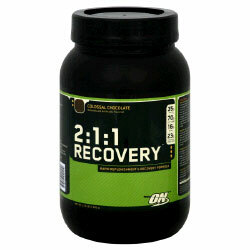 2:1:1 Recovery is a post workout recovery powdered supplement that is made by Optimum Nutrition. Although most will refer to this product as a protein powder it is actually better described as a “carbohydrate powder” with protein added. The supplement contains fast acting carbs and other important ingredients that I will talk about below, and should be taken after workouts or training. 2:1:1 is not your normal whey protein that should be taken at any time of the day. Although you could take it any time of the day if you really wanted to, there is no point and it should be kept to strictly post training. I am going to come out right away and let you know that [highlight color=”FFFF00″]I rate the 2:1:1 Recovery a Perfect 10/10[/highlight] (which is rare for me to do). I have only tried the Colossal Chocolate flavor, and it is hands down the best tasting supplement I’ve ever tried. Although it tastes amazing that isn’t why the supplement gets a 10/10 (although it does help). The ingredients in this 2:1:1 Recovery supplement are what makes it the perfect post workout supplement. – These are the simple sugars and fast digesting carbs that will hit your muscles quickly after a workout to refuel and replenish them. If you know anything about post workout nutrition you know that carbohydrates are extremely important for growth and recovery, and the quicker you can get them the better. 2:1:1 Recovery gives you 35g of these fast acting carbs per scoop. -Of course you also need your protein to help you add muscle and stay lean. Protein is needed as soon as possible after a workout as well, but also through the whole day. This unique blend of three proteins give you quick absorbing protein, and then also a slow absorbing protein and an intermediate absorbing protein. 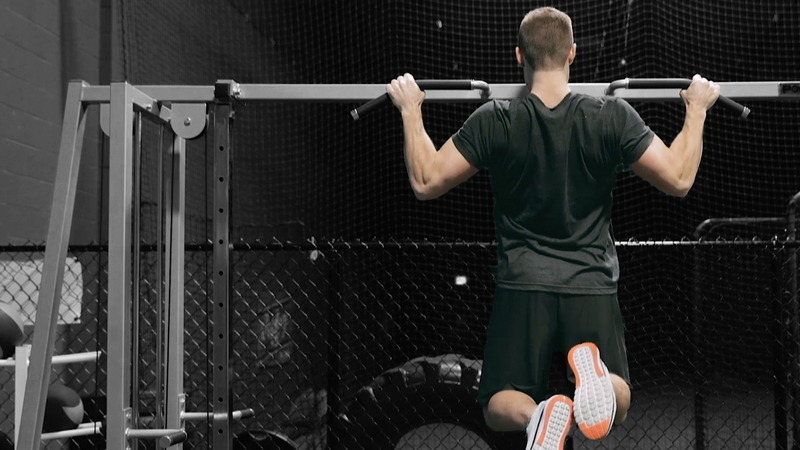 This will fuel your muscles with the protein that will help them grow. -And lastly to make 2:1:1 Recovery the perfect post workout product we have our Branch Chain Amino Acids. You will get 5 grams of BCAAs, which include the three popular post workout BCAAs (Leucine, Isoleucine, and Valine). These are going to stimulate muscle protein synthesis that will both help you grow and also help your muscle recover from your workout. Personally when I’m training hard I like to get more BCAAs into my body so I also use a scoop of the PVL 100% Instant BCAA supplement as well. Two scoops of this 2:1:1 Recovery Supplement immediately following your workout is the best thing you can do for your body. The awesome thing is that you will really be looking forward to gulping this down after a nice hard training session as it literally tastes like Chocolate shake. How do Mucho Mango, Raspberry Rush or Very Vanilla 2:1:1 Recovery flavors taste? I’m not sure, as I cannot give up this Chocolate flavor to even give them a whirl. If you’ve personally tried any of these flavors I’d love if you could leave a comment at the bottom of this page and let me know how they were! Price Review = 2:1:1 Recovery is listed at $41.99 at Bodybuilding.com online, which is about $19 CHEAPER than it is in stores. The bottle lasts for 30 scoops, which would be 15 workouts if you are taking two scoops. That works out to just less than $3 per shake, which is a very fair price. Consider that you are replacing this shake with any other kind of post workout meal that will probably cost that same $3 (if not more) and not be any where comparable to what 2:1:1 Recovery will do for your muscles. I think this is a very fair price, but just make sure you click here to buy it online and save yourself $19. Is 2:1:1 Recovery good if I’m trying to lose fat? Yes, I recommend it for sure – but I would only recommend taking 1 scoop post workout, mixed with a scoop of a pure 100% whey protein (no carbs). That will give you 35 grams of fast acting carbs to refuel your muscles + 17 grams of protein, and then however many grams your other scoop of whey protein has. If you don’t like the taste of mixing (or they are two different flavors) just take the scoop of whey protein following 2:1:1 Recovery. A+++ for 2:1:1 Recovery — highly recommended!